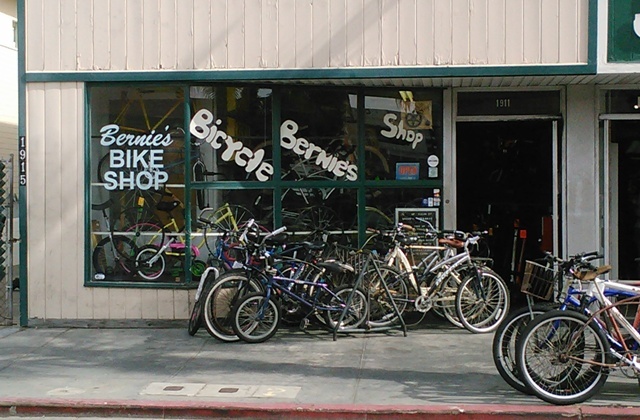 Bernie’s Bicycle Shop has been an Ocean Beach institution for almost 45 years. That’s a long time in a town that is celebrating it’s 125th Anniversary! Current owner, Roger Lovett, had been a regular customer of Bernie’s since he was a kid. Not every grown up can claim they bought the bike shop they used to hang out in when they were little. When Roger bought the shop in it’s original location on Voltaire and Ebers in 1989, he was jokingly threatened by long time customers to retain the original name of Bernie’s. And so he did. Two years later in 1991, he moved the shop to it’s current location at 1911 Cable Street (used to house the Sunshine Surf Shop). Twenty-one years is a long time in a town that has seen too many businesses close in just the last few years alone. There used to be 4 bike shops in OB but most have closed. Roger used to work at a bike shop on Midway for over 9 years, but that shop is no longer there either. About the time when Roger bought Bernie’s he met his wife, Yasuko, on a blind date. She has worked in the shop with Roger ever since. And she is not even a bike rider. But she knows where everything is in that shop and knows the price including tax on every item! When I asked him if they ever had their own web site, he said no, they only have Sundays off and he would never have time to maintain one anyway. Roger said he vacuumed the floor twice at his old shop and decided, what the hell for? It’s just going to get dirty again. And in reading reviews about the shop on Yelp, the funkiness and no pressure selling attitude of the shop is what seems to draw customers in. They feel the OB vibe there and it keeps them coming back. Nothing fancy here, Just a good selection of bikes, lots of parts and quick and easy repairs. Heck, I’ve brought my tryke in several times for squeaks, brakes not working, air in tires, all kinds of piddly little things, and they always seem to be able to help me out straight away. Every single time. When I have offered a few bucks here and there, it was refused by Yasuko or Roger each time. After a year or so of their kindness, I finally just bought them a big old bag of Kettle Corn from the Farmer’s Market as a way of saying thanks for being so cool. Lots of the reviews on Yelp talk about other shops that try to up sell their customers on things they don’t need and their disdain for it. When I asked Roger about this, he said, he was a lousy salesman. When he worked in the old shop on Midway, his bosses would tell him to stay in the back since his salesman prowess was nowhere to be seen. But Roger has no problem shooting the breeze with his customers. In just the few times I’ve gone in there, there always seems to be one rider or another hanging out and talking shop with him. He’s a gentle giant sort of guy and will always take the time to talk to you, and change your flat tire too. I learned also that it’s a $100 ticket if you don’t have lights on your bike at night, wow. I bought two flashing lights after I heard that. When I asked him how he keeps his costs down, since that was one of the most mentioned comments made in reviews, he said, having nothing fancy in there can translate to savings for the customers. While his rent is somewhat high, being a just a couple of stores north of Newport Avenue also makes for a lower rent for a beach area business. 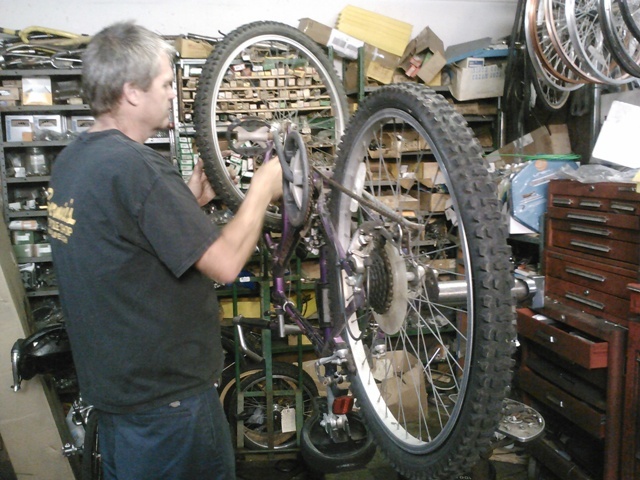 And while he can order a $3,000 bike if you need one, he keeps more moderately priced bikes in the shop. And having a super alarm system helps with that. 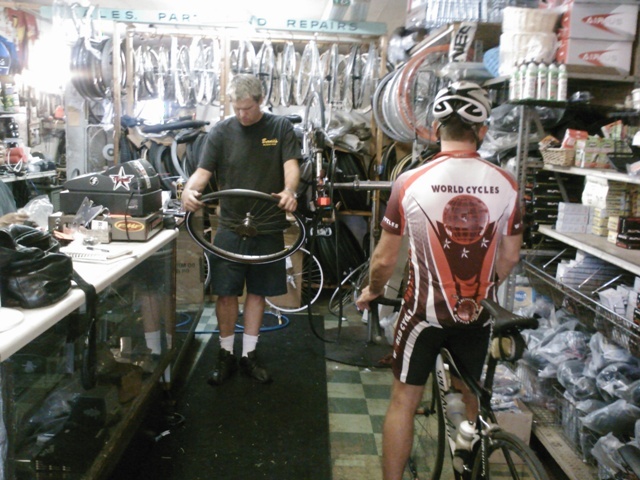 Almost 20 years ago when he first opened, someone broke in and stole just one $600 bike. He has since taken much more secure precautions. Roger is not just a repair guy, where he makes most of his money, but he is also a racer himself. The Velodrome at Morley Field is a place where he likes to cut loose and it has helped him lose a lot of weight in recent times. He said racing season is over right now, but he finished in a higher division then when he first started. He started out in the slower D group, but worked his way up to the faster B group. On Tuesday nights in the Spring and Summer, it’s a great hang out with bands and beer. Sounds like a good time. Race a little, party a little. He also told me about the illegal, yet fun racing on Fiesta Island on Thursday nights. Speed limit there is 25 miles per hour, but he was recently stopped by a Mission Bay Ranger for going 36 miles per hour! But I guess the ranger decided to cut him some slack and he wasn’t given a ticket. I could swear he told me they were racing against cars, but you didn’t hear that from me. Cause it’s illegal don’t ya know. What a great bike shop I love going there for parts or to have Roger break a nut loose. He is always pleasant and makes hang out and talking bikes or other toys to fun. I have frequented Bernies shop for better than 25 yrs “I knew Bernie” It was as good then as it is now. It is an OB stable that hopefully remain for years to come. Roger also went to Point Loma High. 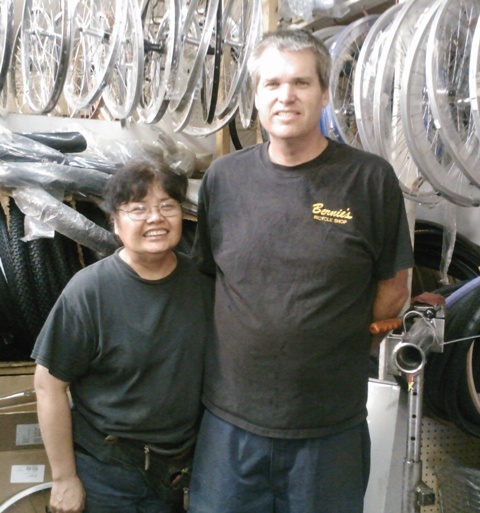 Most of the time I am there for minor bike repairs I am forced to buy something I don’t need, because Roger and Yasuko just refuse to charge me anything for a quick repair and I can’t leave without paying something. So I now have several extra bike lights. When I turn them all on at once in flash mode, it looks like a police car.